Half 40% milk chocolate, half caramel-white chocolate thick Easter egg. Filled with mellow truffles, pralines and caramels. 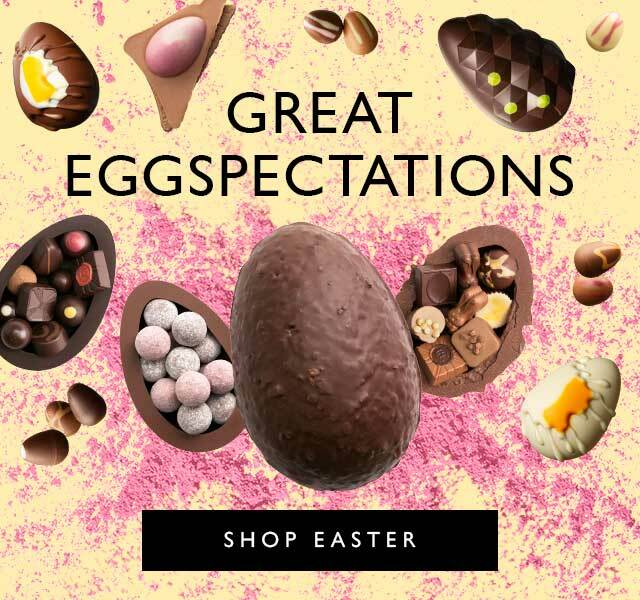 You Crack Me Up is a family-friendly, alcohol-free egg of two generously proportioned halves: mellow 40% milk chocolate and creamy caramel-white chocolate. We’ve wrapped it in gold foil for a glint of anticipation when you untie the ribbon and lift the lid, filled with award-winning treacly pralines and mellow milk truffles. Easter, packed with personality. Ingredients: cocoa solids (cocoa butter, cocoa mass), sugar, full cream MILK powder, runny caramel (glucose fructose syrup, sweetened condensed MILK, half salted butter (from MILK), sugar, salt, emulsifier (SOYA lecithin), water), HAZELNUT paste, sweetened hazelnut paste (HAZELNUTS, sugar, emulsifier (sunflower lecithin)), skimmed MILK powder, butter oil (from MILK), whipping cream (cream (from MILK), stabiliser (carrageenan)), stabilisers (sorbitol, glycerol), emulsifiers (SOYA lecithin, sunflower lecithin), caramelised sugar, glucose syrup, PECAN NUT paste, whole MILK, natural flavours (caramel, vanilla), natural colour (paprika), sea salt, vanilla seeds.Milk chocolate contains minimum 40% cocoa solids, minimum 20% milk solids.Caramel chocolate contains minimum 36% cocoa solids, minimum 26% milk solids.White chocolate contains minimum 36% cocoa solids, minimum 27% milk solids.For allergens, including cereals containing gluten, see ingredients in bold. ALL CHOCOLATES IN THIS BOX MAY CONTAIN TRACES OF PEANUTS, TREE NUTS, MILK, SOYA, WHEAT, GLUTEN, EGG, SESAME.